One little debated consequence of Sunday’s German election is that it significantly increases the prospect of Grexit, i.e. of Greece leaving the eurozone. The last bailout of Greece in 2015 was not uncontroversial. The IMF bureaucracy has never made any secret of its doubts about it. Some of the other creditor states of the EU – for example, Slovakia and Finland – are known to have been unhappy, whilst economists in the US and Britain were outspoken in their opposition. However, the bailout agreement was in the end railroaded through because it had the backing of Germany, by far the strongest state in the EU. The bailout agreement was, however, also controversial in Germany itself. The Finance Ministry and the Bundesbank are known to have had their doubts, as did many members of Chancellor Merkel’s CDU party. 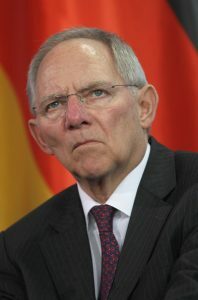 The best known skeptic was, however, Germany’s Finance Minister Wolfgang Schäuble (pictured), who proposed at the height of the bailout crisis that Greece leave the eurozone “temporarily” in return for a haircut of its debt. Unofficially, it is reported that he also proposed that Greece be given a 50 billion euro parting gift to tide it over the inevitable turbulence that would follow in the aftermath of its leaving the eurozone. Chancellor Merkel is known to have given serious thought to Schäuble’s proposal, and he at least seems to have thought for a short time that it had her backing. However, in the end the proposal was ditched in favour of another bailout of Greece following strong objections to Schäuble’s proposal from France and Italy (who were worried for the future of the eurozone if one of its member states left) and above all from the US, which saw Greece’s continued membership of the eurozone and of the EU as vitally necessary for NATO’s continued presence in the eastern Mediterranean. It was in fact apparently a telephone call from US President Obama that finally persuaded Chancellor Merkel to drop Schäuble’s proposal and give instead the proposed bailout of Greece her backing. Though there was some unhappiness in Germany that the country had again been pushed into bailing out Greece, in the absence of any parties in the Bundestag opposed to the bailout Merkel had no difficulty getting it through. That position has, however, now changed. The AfD was originally set up to oppose bailouts by Germany of the eurozone’s weakest states, and it is a certainty that if any further bailouts are ever proposed, whether of Greece or of any other of the eurozone’s weaker states, it will vehemently oppose them. That means that, unlike in 2015, if any further bailout of Greece is proposed in future, unlike in 2015 there will be a party in the Bundestag which is guaranteed to oppose it. In other comments, Lindner is also reported to have said that Greece should be given a payoff to help it through the expected turbulence it will suffer once it leaves the eurozone. What Lindner is proposing is, of course, the same as what Wolfgang Schäuble proposed in 2015. Moreover, it appears that Lindner is angling to replace Schäuble as Finance Minister. Here it is necessary to make a number of points. Firstly, it is a certainty that sooner or later Greece will need a further bailout if it is to remain in the eurozone. At the present time, the official view in Greece is that the worst of the crisis has passed, and that the country is recovering. I do not know anyone in Greece who shares that view. What is for the moment sustaining Greece’s economy is a temporary revival of the eurozone economy caused by the European Central Bank’s bond buying and quantitative easing programme. However, it is debatable whether the European Central Bank will be able to continue with this programme for much longer. Not only is opposition to the programme in Germany since the election certain to grow, but the general global tightening of monetary conditions as a result of the US Federal Reserve Board’s unwinding of its quantitative easing programme appears to make the European Central Bank’s own bond buying and quantitative easing programme unsustainable. All it will take is a dip in the economy of the eurozone for Greece to fall back into crisis, and with the European Central Bank’s bond buying and quantitative easing programme certain to end before long, I know scarcely anyone in Greece who is properly informed about the situation who doubts that sooner or later this is what will happen. When it does Greece will need another bailout if it is to stay in the eurozone. Secondly, though Lindner’s statements and those of the FDP could not be more emphatic, it is likely that if a further Greek bailout situation arises, he and the FDP will come under strong pressure to reverse their stance. 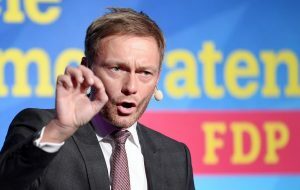 The same economic and geopolitical factors that lay behind the 2015 Greek bailout will still be there, making it a certainty that Lindner and the FDP will face demands from the EU bureaucracy, from the European Central Bank, from the Atlanticist wing of the German establishment and from the US to soften their stance. However, it is doubtful they will do so. The FDP lost its position in the Bundestag following the previous parliamentary elections of 2013 in part because, as Chancellor Merkel’s junior coalition partner, it went along with all her orthodoxies. The FDP will not want to be put in the same position again. Given the strong position against further a bailout that Lindner and the FDP have taken, and the likely popularity within Germany of that stance, there will be strong opposition within the FDP if Lindner shows any inclination to reverse it, and it must be unlikely he will do so. The odds must therefore be that when the next demand from Greece for another bailout comes, the FDP will oppose it, in which case Merkel will risk the future of her coalition if she insists on it. Moreover, she will do so in support of a policy which is unpopular, and which will be opposed in the Bundestag and in the country by the AfD, leading to a high probability that opposition to a further bailout within the CDU will also crystallise. Indeed, it is likely that as the crisis within Greece resumes – as sooner or later it will – the knowledge of the opposition to a further bailout in Germany will have a chilling effect, and will harden opposition to the bailout in other countries in the eurozone which would have to agree to it, like Slovakia and Finland. In that case, it becomes extremely difficult to see how a further bailout could take place, in which case despite the opposition of France, Italy, the EU bureaucracy, the US and the Greek elite, a Grexit (ie. Greece’s exit from the eurozone) will finally have to take place. Whilst it is too soon at the moment to say that the German election has definitely paved the way for a Grexit, realistically that looks like the most likely outcome. There is a commonly expressed view that if a Grexit takes place and Greece finally leaves the eurozone, the eurozone itself will unravel as it is exposed as nothing more than a currency union rather than a true single currency. I have never shared this view. On the contrary, I believe that the eurozone will continue better without Greece, which will remain in all other respects a member state of the EU. Following the German election, it now looks as if before long this opinion will be put to the test.